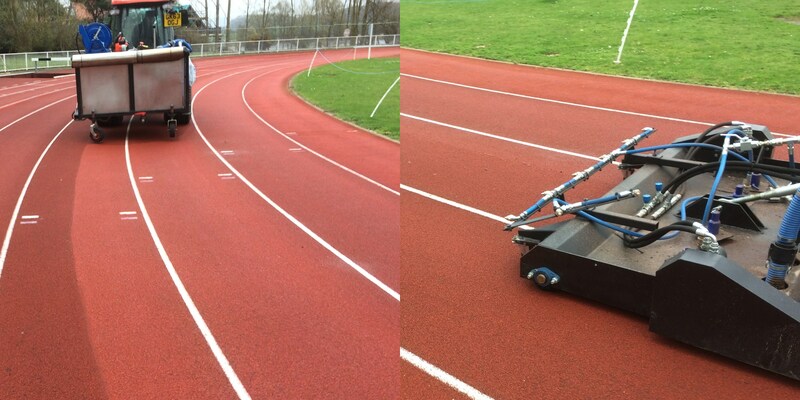 Bourne Sport unleashed its new custom built track washer on the Julie Rose stadium in Ashford on Friday. The track washer was built in our own workshops and designed to improve further on some of the proprietary machines currently on the market. After extensive testing and final adjustments to our initial design the machine performed excellently. It will next appear at the Guildford Spectrum and the Withdean Stadium, Brighton. The machine is built around a Kubota 50hp compact tractor and comprises a high pressure washer mounted on the front and a high output vacuum pump with clean and dirty water tanks located on the back. It is designed for cleaning polymeric running tracks but can also address any artificial surface where high pressure washing and removal of dirty water is required. Where tractor access is restricted, the machine can be used with two high pressure lances on long reels and pedestrian vacuuming units. Regular washing not only makes the surface look good, but also ensures its longevity and performance. An opportunity for our customers to liven up their summer playing surfaces! This is a sneak preview of an e-mail flyer that will be going out all over SE England on Friday, aimed at groundskeepers at football and rugby clubs, parks and local councils. Now is the time to prepare pitches for the summer season - they will typically need top-dressing, scarifying and re-seeding. If they look like the picture in the flyer, then some verti-draining and perhaps bigger drainage works would be required, too. Sports pitches wear unevenly and special attention will be needed at the goal-mouths, for example. Note that it's not just natural pitches that need winter maintenance - 3G and hybrid pitches also need looking after, if they are going to survive through their full potential life-span, which could be ten years or more. 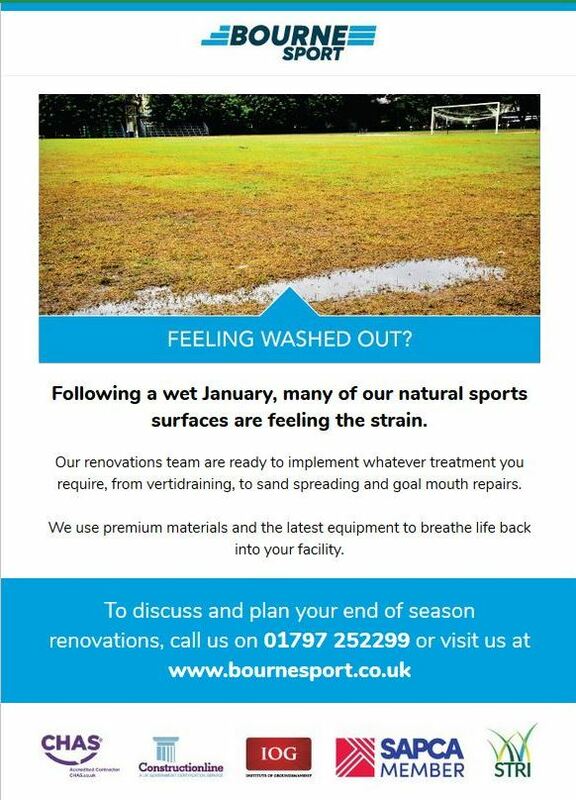 This is the time of year to be renovating the grass surfaces of parks, in preparation for the new season. Yes, it was snowing yesterday, even in Newenden, but spring is only around the corner! 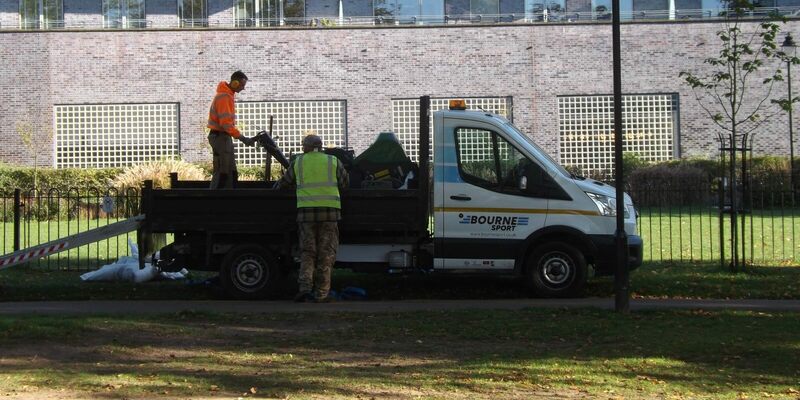 So here we are working on various parks around Camden, on behalf of our friends at idverde. 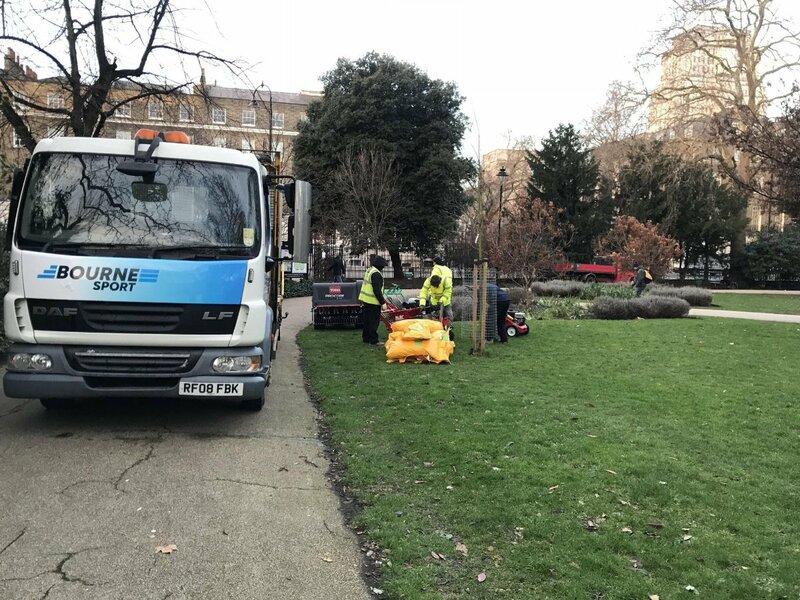 Russell Square is the first one - the works involve vertidraining, scarifying, top-dressing and over-seeding. It's a big square - it needs 60 tonnes of rootzone. There are ten more parks to do in this round - will keep us busy!